Two weeks ago our lectionary began a series of Gospel readings which give us the opportunity to consider Jesus’ “Sermon on the Mount.” The sermon begins with a series of blessings: those who are poor, mourning, merciful, pure in heart, etc. are blessed! These are not the kinds of people who our society tends to honor. Nevertheless, Jesus says they are honored by God! They are those who make up the Kingdom of Heaven. And in our lesson today, Jesus goes further – they are salt; they are light. Actually – “they” are you – and YOU are salt and light! This weekend I am going to focus on salt, since over the last month or so there has been a lot of focus on light and darkness in our lessons. There is much that can be said about salt. Most, importantly, it is essential for life. Salt was a central part of the lives of people in the 1st century. There were major salt deposits in Palestine, salt mines were worked, the Dead Sea is dead because the salt or sodium levels are so high that no life can be sustained in its waters. We think of salt today primarily as a flavoring agent, and we have other uses for salt – making ice cream, melting ice, water purification and so on. But in the 1st century, salt was used primarily as a preservative. For example, fish that were harvested from the Sea of Galilee had become a major delicacy in the Roman world. So fishermen (like Peter, Andrew, James and John) would catch the fish and then they would be salted and dried and then shipped around the Roman world – especially to Rome – where they drew top drachma. There were other uses as well. Taste was a use of salt, even if it was not the major use. Salt plates were used to stoke fires used for cooking as they burned slowly and would help to maintain a consistent heat of the fire. The word “Salary” has at its core the word salt (sal), which comes from the Latin salarium. Pliny the Elder tells us that Roman troops were originally paid in salt, so that is where the word comes from. How does all of this relate to Jesus words in verse 13? Well, I could take a couple different approaches here. I could list all of these uses of salt and try to force illustrations or metaphors upon each one. They all don’t really work, so then what does Jesus mean by this? Following after the Beatitudes I believe it is clear that Jesus is NOT exhorting us to be salt, or be light. Jesus is saying – as children of God and citizens of the Kingdom of Heaven you ARE salt – you ARE light. And not only that, but you are essential – just like salt. And just like salt is so obvious when it is present – so are you. You are the salt and light of the Kingdom. Others experience God’s kingdom through you. Or to put it another way – others can taste the Kingdom of Heaven through your saltiness!!! Over the next few weeks please get your stories and cards back to me and I will find a way to display them. It is so easy for us to miss signs of God’s presence. Jesus’ sermon proclaims loudly – God is present and is in your midst and all around – and God is even using you and salt and light! I am preparing a Bible study group. We are using the gospel of Matthew this year because of the readings this cycle. We are on Chapter 5 and I wanted to spend some time on the theme salt. This helped and the picture of the cross made out of salt caught my eye. 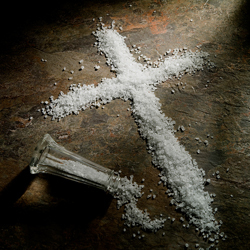 I am going to make a cross of salt with the group participation as we discuss our being salt as Christian disciples. Thanks for having this site on line. God bless your efforts in being salt and light of God's love and care this week. God spirit continue working in you and those you encounter.